Does Your Cat or Dog Have Bad Breath? Does your cat or dog have bad breath? Bad breath is not just a cosmetic issue. It can be a sign of an underlying health issue such as acid stomach, dental or gum infections, poor digestion or kidney disease. For example, if your kitty has drooling, difficulty eating and red, inflamed gums along with the bad breath, that can be a sign of a serious autoimmune condition called stomatitis. If your dog has bad breath and is eating grass and vomiting on occasion, it can be a sign of painful acid reflux. Be sure to bring your pet's bad breath to the attention of your veterinarian. Following a holistic approach with diet changes (a low carbohydrate, hypoallergenic diet) and a few natural supplements can also help. 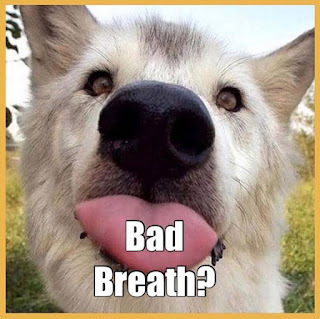 Power Probiotic, K9 Digestive Enzymes, Colostrum and Soothing Digestive Relief are helpful for cats and dogs with bad breath. To learn more about how to help your pet’s bad breath click here. Power Probiotic - Pure, safe and natural--absolutely no fillers! Power Probiotic repopulates good intestinal flora which is essential for pets with digestive issues and bad breath. Soothing Digestive Relief - Gentle, effective formula for the treatment of any type of indigestion in pets. Helps with gas, loose stool, mucous in stool, tummy rumbling, diarrhea and malabsorption. K9 Digestive Enzymes (for larger dogs)- This powerful digestive enzyme is more complex than typical pet enzymes and helps pets digest protein and fats. Contains HCL and pancreatin--two animal-based nutrients that help ensure proper digestion of protein and reduction in symptoms related to poor digestion. Reduces tartar on teeth and improves breath.